This large tree was cut down or chopped up after it fell. It was living in Collier Park for decades until this past weekend. If we find out any more information about what happened, we’ll let you know. IN the meantime, we’re never happy when a large life form crashes to earth in our little acre of paradise. Ashley Lewis took the shot. From the photo it’s a tip-up, so the tree fell before it was cut. While I (professionally) like “coarse woody debris”, aside from the attractive nuisance liability for kids getting injured, that’s way too much fire fuel to have at ground level in an urban area, especially during this drought. 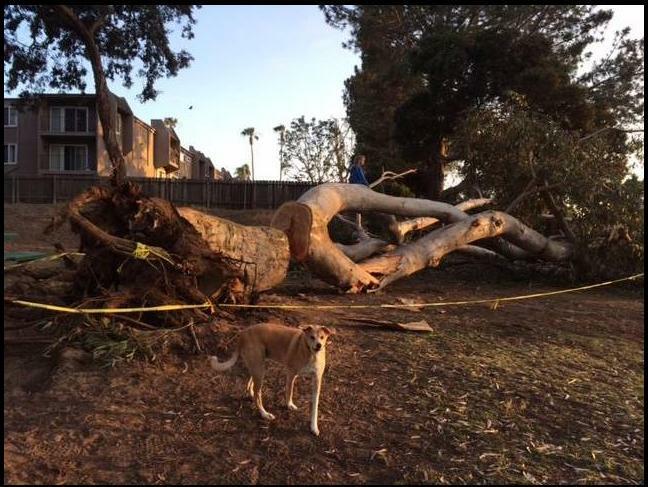 A lot of the larger older Eucalypts across San Diego are going to meet this fate in the next decade or 2. Many of the very tall palms in OB are also reaching their maximum ages & heights. Its predictable & knowable, but we certainly aren’t going to plan for it, as that would point to a need to spend $$, and just increase our liability when they fall. I was at a gathering in the park on Saturday. One of the group said they saw someone just kick it over that morning. Obviously, it had to be pretty diseased for that to happen. I got a good picture of it too.